You might remember earlier this year, Kath from the allotment group joined me to plant pumpkins with the Eco-Hero group from Ysgol Dwerenfa. We chose to plant pumpkins as we thought it would be a good idea to have a Community Pumpkin Soup event at the end of autumn. We began our soup making with the Lazers youth group, run by volunteers in Bethania Church. I never imagined that 12 teenagers, (mostly boys) would be so keen to make soup. One young person brought in a loaf of bread to share, so everyone was able to take home a big cup of soup and a chunk of crusty bread. We then moved on to making soup with the Eco Heroes, who kindly invited the Community to attend the School for soup and entertainment. Helen the older person’s strategy co-ordinator and I joined the Eco – Heroes after school to make the soup. The school cook allowed us the use of the school kitchen. I am not sure who enjoyed being in the school kitchen the most! The next day, 22 people from the community arrived at the school hall – a mixture of parents, grandparents, babies and older people in the community who have never been to school before. The children assisted with serving anything that was not hot, including milk, bread, butter and the wonderful cupcakes, made by Christiana, who provides support for people who live in the Older Person’s housing. The children also provided us with entertainment including poems and songs. It was a fantastic afternoon; I could hear people talking about it in the Café On Thursday. 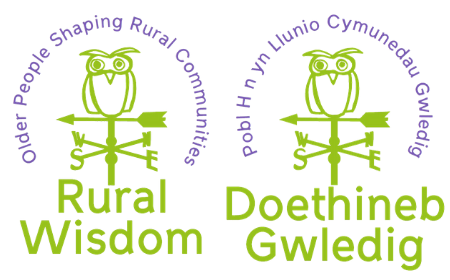 People who attend have expressed how much they enjoyed it; I know the School enjoyed it too, and are keen to continue to develop more intergenerational events with Rural Wisdom. With November coming to an end, it is time to put away the pumpkins and make room for Christmas jumpers. I will look forward to catching up with you in December.